Thomas was the son of Samuel and Elizabeth Woodburn, and brother of Miss M. Woodburn, Tyressan, Cookstown, County Tyrone. 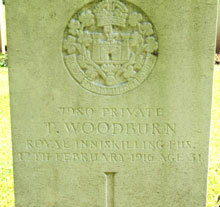 Private Woodburn was killed while doing his duty in the trenches on the 12th February 1916. 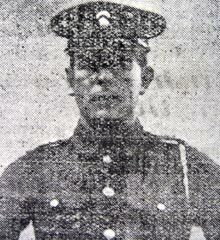 Sergeant J. Preston who was in Private Woodburn’s company indicated that Thomas Woodburn was killed instantly when he was struck down by shell fire. At the time of his death, Thomas had over 12 year’s military service.